Help your CT Princess Party Run Smoothly with these Royal Tips. We get a lot of questions from our parent-clients wondering if we need anything from them. The answer is mostly “nope!”, but there are a few things you can do to help make your party run smoothly for your little guests and our artists! Add balloons to your mail box. This is the best idea any parent has ever had! Maybe 1/3 of the parties we go to do this. You can get some helium inflated ones from a local party store and tie them right on your mailbox, fence, or front door. Not only will our artists have an easier time finding your home, but so will guests! Princess parties are not only fun because kids get to participate and feel special, but because you can keep the memories forever! Guests can take photos throughout the party, or during our special photo shoot. For face paint and makeover princesses, consider getting some mirrors. Kids love to see their faces in the mirror once they’ve been painted or made over. Our face painters and makeup artists always have mirrors with them, but only enough to show the kids who are in their seat: otherwise, the other kids will run off with them! Grab a floor length mirror and bring it outside secured to something, or run to the dollar store for a few hand-mirrors while you’re picking up other things for your event. Just make sure you tie the mirrors to a table or chairs, otherwise they’ll all disappear in the first few minutes! For balloon twisting, consider getting some hampers. Our balloon sculpture are super popular, but during cake time or pool time, leaving them on the grass or tables can pop them. Get some cheap hampers from the dollar store or whatever you have in the house and put them in an out-of-the-way spot in the shade. Kids can pile in their balloons when they’re done playing and pick them back up once they leave! Our balloon twisters often transport premade balloons like this, so piling a whole bunch on top of each other won’t damage them. It’s much safer than the grass! 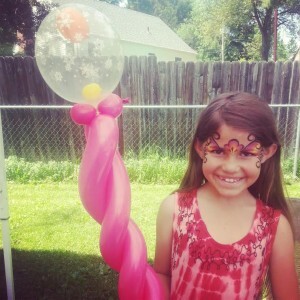 For both face painter, balloon twister, and makeover princesses, a small set up area. Our artists can all bring folding tables and chairs if requested, but we usually ask our clients provide them to help keep our costs (and prices) down. Just a small folding table or even part of a picnic table is fine, and two chairs: one for the artist, and one for the child! Makeover princesses may also need an electrical outlet for curling irons. For singalong & story time princesses, an open area to play near an electrical outlet. Our princesses speakers may need to be plugged in for singalongs. They’ll also need a space to play, and a chair to read stories from. (Their dresses are extra fancy, so we don’t want any kitten hair or grass stains to ruin them!) The space can be anywhere, from a living room to a back yard, although we prefer to be indoors–especially in the CT summer heat! Don’t have too many other things going on. Our princesses can adjust to different party environments, but putting them next to loud speakers or a bounce house can make the special day distracting. If you’re going to have other activities, let our office know ahead of time so we can prepare our princesses.